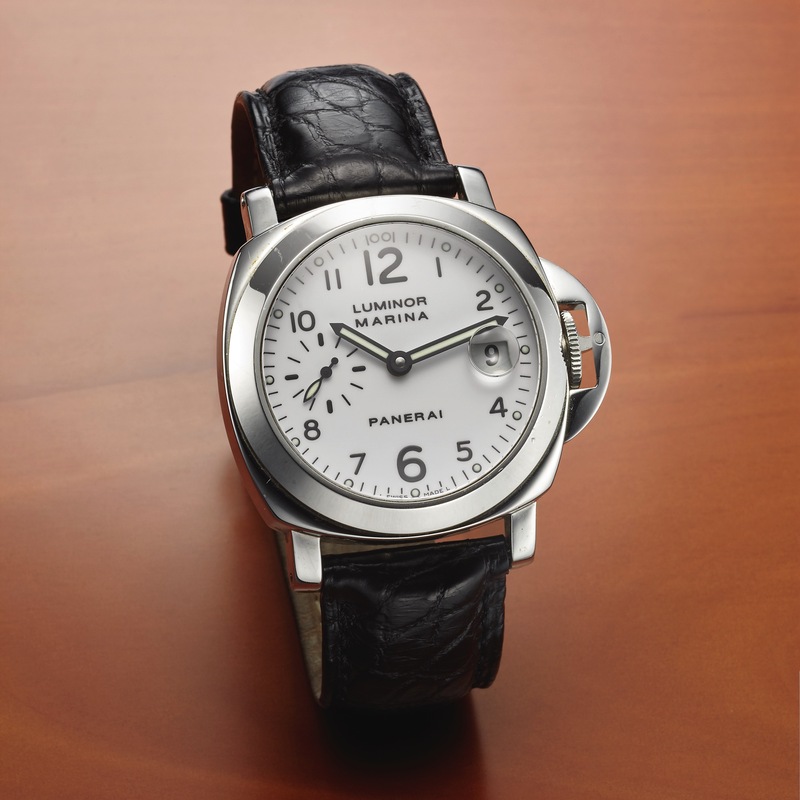 PANERAI REF. 6529 LUMINOR MARINA DIVERS STEEL Officine Panerai, Firenze 1860, "Luminor Marina," BB 987298, No. B 0072 / 4000, Ref. OP 6529. Made in a limited edition of 4000 pieces in 1999. Fine, large, cushion-shaped, self-winding, water-resistant, stainless steel military diving wristwatch with date and a stainless steel Panerai double deployant clasp. Accompanied by a fitted box. Three-body, polished and brushed, screwed-down engraved case back, patented crown with security lever, domed sapphire crystal with cyclops lens. White with painted Arabic numerals and luminous indexes, subsidiary seconds dial at 9, aperture for the date. Luminous steel baton hands. Cal. 7750-P1, rhodium-plated, 21 jewels, straight line lever escapement, monometallic balance adjusted to 5 positions, shock absorber, self-compensating flat balance spring. C. Three-body, polished and brushed, screwed-down engraved case back, patented crown with security lever, domed sapphire crystal with cyclops lens. D. White with painted Arabic numerals and luminous indexes, subsidiary seconds dial at 9, aperture for the date. Luminous steel baton hands. M. Cal. 7750-P1, rhodium-plated, 21 jewels, straight line lever escapement, monometallic balance adjusted to 5 positions, shock absorber, self-compensating flat balance spring. Dial, case and movement signed. DIAM. 40 mm. THICKNESS 16 mm.